Artist Simon Gush talks about the red Mercedes-Benz that workers gave to Nelson Mandela in 1990, the ensuing strike at the car manufacturing plant, and the power balance 20 years into South Africa's democracy. Thabiso Sekgala is one of the few younger photographers whose work is featured in The Rise and Fall of Apartheid. We spoke to him about South African photography, European perceptions of African art and his latest exhibition in Berlin. 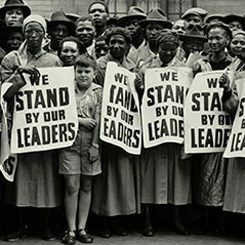 Peter Magubane talks to Percy Mabandu about the day he took the famous and evocative "Europeans Only" photograph 58 years ago. Mary Corrigall spoke to renowned South African author Fred Khumalo about the significance of the 20 year anniversary of the country’s democracy and how the literary imagination has evolved in that time. Young South African photographer Lebohang Kganye talks about Ke lefa laka, a photographic research into the history of her family. She says "The work refers to apartheid, an era that’s behind us. But it also speaks to the present that is very much impacted by apartheid." An art exhibition at GoetheonMain saw young artists responding artistically to an interview with anti-Apartheid martyr and South African Communist Party leader Chris Hani. Marelise van der Merwe spoke to curator its curator Gabi Ngcobo. Along with an exhibition, photographer Reiner Leist’s new book of photographs "Another Country" explores signature portraiture. World-renowned South African photographer David Goldblatt in conversation with writer Neelika Jayawardane.